Here to Help Light the Way!!!" "Greetings Beloved Family! 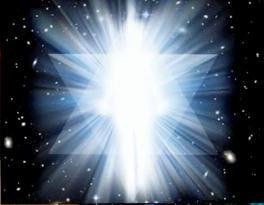 I am Sananda, and I am here with Ashtar and all of the Light Beings here gathered on the Bridge of The New Jerusalem. Now, I do have my own ship, but I travel most often either in my own merkaba, or with Ashtar, because we, along with Saint Germain and many others, are here to ensure the success of your Ascensions, of the Ascension of Planet Earth. Because this is the moment, as you measure time, for all of this to be in progress! "And it is, in its own way, complicated, yes. That is why there are so many of us here. That is why we have so many different missionswithin the Mission. However, for you, most Beloved Ones, it is simple. It is to be in Love. It is to BE LOVE!!! It is to express Love. It is to live Love, to bask in its energies, to feel its upliftment and the Freedom that it gives you. And it is to shine it bright within your own selves. Let your Hearts expand. Let your whole beings vibrate in its energies and know Who You Are! "It is so easy to forget what Divine Masters you are, when you are in the low vibrations. There is a constant barrage of energies being beamed at you to attempt to keep you in the low places, where you cannot thrive, because that is the program, or the programming, that you have experienced before. And up until most recently, as you measure time - in this century and a bit before that -you have been living in and experiencing and, let's face it, you've been denied your Freedoms to expand into the Love You Are. "But wait a minute! This denial may have been programmed, may have been controlled and propagandized and so on, by those who would have dominion over you. But how has this accomplished what it has accomplished? How has it been successful if it were not for Humanity's allowance of it up to a point? "Now, does that sound like blame? It is not. It is simply an observation of where the Humanity of Planet Earth has been. There had been bright spots, bright moments and certainly a lot of wonderful upliftments given by those who have come to do so - oftentimes at the loss of their own physical lives - but nevertheless, they have contributed. They came when it was so dark. "Now, here you are, a Planet of Light Beings, recognizing your own Ddivine qualities, recognizing that you are made from the Light of Love, and recognizing that you are here to help lead the way - to light the way literally - for all those who are still slumbering and, yes, for those who are in resistance. The future - as you call it - your timeline is so bright as it joins with the timelines of all of Humanity, and, indeed, with all of Mother Gaia’s kingdoms, lifting Planet Earth up and up and up - back, shall we say, to its beginnings as a Planet of LoveLight, a Higher Dimensional Pplanet, enjoying the Higher Dimensional Lifestyles!!! "And now, Beloved Ones, here you are, and here we are together to join our energies - our LoveLights - and come together in this magnificent endeavor which is already seen as successful or, as Ashtar likes to say, 'Mission Accomplished!' So there is no need for you to hesitate, and I, Sananda, assure you, from the LoveLight in my Heart to the LoveLights You Are, that you are in exactly at the right place in exactly the right moment. This is what you came for and you are here to assist in lighting the way to the successful Ascension of Planet Earth and of yourselves, if that be your choice! "You still have choices. Planet Earth is a planet of free will, but what is happening - and you heard about this already - what is happening is that there will no longer be empowerment for those who choose to disrespect your free will, for those who choose to try to darken the Lights of Love already burning so brightly that they are seen throughout the Universe, as are you! You are all radiant beings!!! You are all here to be Love, to teach Love, to share Love in any way that you are inspired so to do, and to be in Love with yourselves and your purpose. "Thank you, Beloved Ones, for joining with me. Blessings to all of you. Take this Love into your Hearts, expand it throughout your beings, and send it out over all of Planet Earth and throughout the Universe beyond! I promise you, we are together. I am here with you as you are here with me, and there is absolutely no distance or separation between us. We are together in Love and its magnificent energies!!! Blessings to all of you and thanks be unto you, for sharing your LoveLights with us all! And so it is. Namaste!"